Today we were up bright and early to watch Aidan's Esophagram with Dr. Deitz at 8am we show up and they rescheduled for 9am, who needs sleep anyways. The pictures were very cool and I had asked if we could get a CD with them all. Dr. Foker came in to place more straws in Aidan's sutures and instead of surgery on friday they are scheduling him for monday. We think the gap is a little too long to get surgery tommorrow. They put in a Red Robinson which is a catheter to the top of his distal esophagus to use in surgery to push his distal esophagus up, instead of having to have a GI doctor pushing it up. 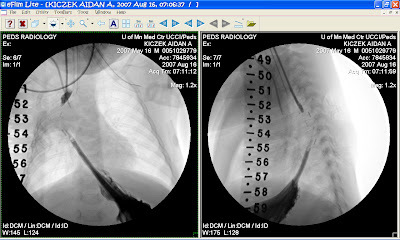 Due to the fact it was in his esophagus I had mentioned to the nurse not to attach it to suction or give any medications through it. The next nurse had asked about it and I mentioned no medications or suction and she said it was hooked to suction and I nearly killed someone. We later found out it was hooked to the suction line but the vacuum line was turned off! Thank god I love turning things off. Since the surgery is on Monday and Dr. Kahn is available the Red Robinson is coming out as soon as Kirsti can get here with a new MicKey G-Tube. P.S. Aidan is now 3 months old today! We celebrated it with an Esophagram and bought him a new outfit.